Every loop is checked with a dummy round to verify correct fit. Capacity: (100) 30/40 Krag rounds and (12) .38 caliber pistol rounds (.45 caliber pistol loops may be special ordered at no additional charge). All belts are completely finished and include brass "C" closure, belt ends, keepers, left side eyelets and saber hook. Standard length fits 30 to 48 inch waists. A very high quality belt. (extra long belts are available at $10 additional). Our reproduction "Mills" belts are the correct regulation belt to accompany your Krag rifle. We are very proud of these belts and guarantee your satisfaction. The belts and most fittings are made in our own shop in Benicia, California. Dimensionally, our belts are very close to the original Mills product. The fabric color is spot on and the fittings will exchange with originals. 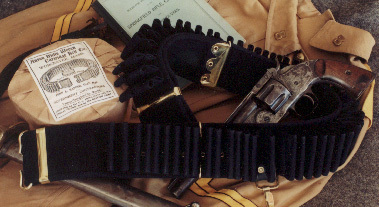 The only significant differences between our reproduction belts and the originals are: 1) The cartridge loops are applied to the belt body by sewing them on instead of being woven integral with the belt body and, 2) The weave of the belt body and loops is finer than the coarse weave of original Mills webbing.